For the museum, see Louvre. For other uses, see Louvre (disambiguation). The present-day Louvre Palace is a vast complex of wings and pavilions on four main levels which, although it looks to be unified, is the result of many phases of building, modification, destruction and restoration. The Palace is situated in the right-bank of the River Seine between Rue de Rivoli to the north and the Quai François Mitterrand to the south. To the west is the Jardin des Tuileries and, to the east, the Rue de l'Amiral de Coligny, where its most architecturally famous façade, the Louvre Colonnade, and the Place du Louvre are found. The complex occupies about 40 hectares and forms two main quadrilaterals which enclose two large courtyards: the Cour Carrée (Square Courtyard), completed under Napoleon I, and the larger Cour Napoléon (Napoleon Courtyard) with the Cour du Carrousel to its west, built under Napoleon III. The Cour Napoléon and Cour du Carrousel are separated by the street known as the Place du Carrousel. The Louvre complex may be divided into the "Old Louvre": the medieval and Renaissance pavilions and wings surrounding the Cour Carrée, as well as the Grande Galerie extending west along the bank of the Seine; and the "New Louvre": those 19th-century pavilions and wings extending along the north and south sides of the Cour Napoléon along with their extensions to the west (north and south of the Cour du Carrousel) which were originally part of the Palais des Tuileries (Tuileries Palace), burned during the Paris Commune in 1871. Some 51,615 sq m (555,000 sq ft) in the palace complex are devoted to public exhibition floor space. The Old Louvre occupies the site of the Louvre castle, a 12th-century fortress built by King Philip Augustus, also called the Louvre. Its foundations are viewable in the basement level as the "Medieval Louvre" department. This structure was razed in 1546 by King Francis I in favour of a larger royal residence which was added to by almost every subsequent French monarch. King Louis XIV, who resided at the Louvre until his departure for Versailles in 1678, completed the Cour Carrée, which was closed off on the city side by a colonnade. The Old Louvre is a quadrilateral approximately 160 m (520 ft) on a side consisting of 8 ailes (wings) which are articulated by 8 pavillons (pavilions). Starting at the northwest corner and moving clockwise, the pavillons consist of the following: Pavillon de Beauvais, Pavillon de Marengo, Northeast Pavilion, Central Pavilion, Southeast Pavilion, Pavillon des Arts, Pavillon du Roi, and Pavillon Sully (formerly, Pavillon de l'Horloge). Between the Pavillon du Roi and the Pavillon Sully is the Aile Lescot (Lescot Wing): built between 1546 and 1551, it is the oldest part of the visible external elevations and was important in setting the mould for later French architectural classicism. Between the Pavillon Sully and the Pavillon de Beauvais is the Aile Lemercier (Lemercier Wing): built in 1639 by Louis XIII and Cardinal Richelieu, it is a symmetrical extension of Lescot's wing in the same Renaissance style. With it, the last external vestiges of the medieval Louvre were demolished. The New Louvre is the name often given to the wings and pavilions extending the Palace for about 500 m (1,600 ft) westwards on the north (Napoleon I and Napoleon III following the quarter-mile-long Henry IV Seine Riverside Grande Galerie) and on the south (Napoléon III) sides of the Cour Napoléon and Cour du Carrousel. It was Napoléon III who finally connected the north end of the Tuileries Palace with the Louvre in the 1850s, thus finally achieving the Grand Dessein (Great Design) originally envisaged by King Henry IV of France in the 16th century. This consummation only lasted a few years, however, as the Tuileries was burned in 1871 and finally razed in 1883. The northern limb of the new Louvre consists (from east to west) of three great pavilions along the Rue de Rivoli: the Pavillon de la Bibliothèque, Pavillon de Rohan and Pavillon de Marsan. On the inside (court side) of the Pavillon de la Bibliothèque are three pavilions; Pavillon Colbert, Pavillon Richelieu and Pavillon Turgot; these pavilions and their wings define three subsidiary Courts, from east to west: Cour Khorsabad, Cour Puget and Cour Marly. The southern limb of the New Louvre consists (from east to west) of five great pavilions along the Quai François Mitterrand (and Seine bank): the Pavillon de la Lesdiguieres, Pavillon des Sessions, Pavillon de la Tremoille, Pavillon des États and Pavillon de Flore. As on the north side, three inside (court side) pavilions (Pavillon Daru, Pavillon Denon and Pavillon Mollien) and their wings define three more subsidiary Courts: Cour du Sphinx, Cour Visconti and Cour Lefuel. The Chinese American architect I.M. Pei was selected in 1983 to design François Mitterrand's Grand Louvre Project (1981–2002). A vast underground complex of offices, shops, exhibition spaces, storage areas, and parking areas, as well as an auditorium, a tourist bus depot, and a cafeteria, was constructed underneath the Louvre's central courtyards of the Cour Napoléon and the Cour du Carrousel. The ground-level entrance to this complex was situated in the centre of the Cour Napoléon and is crowned by the prominent steel-and-glass pyramid (1989), the most famous element designed by Pei. In a proposal by Kenneth Carbone, the nomenclature of the wings of the Louvre was simplified in 1987 to reflect the Grand Louvre's organization. Corresponding to the three pavilions through which the public must pass to reach the museum from the main reception area under the glass pyramid, the north part of the complex is now referred to as the Richelieu wing; the east, as the Sully wing; and the south, as the Denon wing. This allows the casual visitor to avoid (to some extent) becoming totally mystified at the bewildering array of named wings and pavilions. The origin of the name Louvre is unclear. The French historian Henri Sauval, probably writing in the 1660s, stated that he had seen "in an old Latin-Saxon glossary, Leouar is translated castle" and thus took Leouar to be the origin of Louvre. According to Keith Briggs, Sauval's theory is often repeated, even in recent books, but this glossary has never been seen again, and Sauval's idea is obsolete. Briggs suggests that H. J. Wolf's proposal in 1969 that Louvre derives instead from Latin Rubras, meaning 'red soil', is more plausible. David Hanser, on the other hand, reports that the word may come from French louveterie, a "place where dogs were trained to chase wolves". The original Louvre was nearly square in plan (seventy-eight by seventy-two metres) and enclosed by a 2.6-metre thick crenellated and machicolated curtain wall. The entire structure was surrounded by a water-filled moat. Attached to the outside of the walls were ten round defensive towers: one at each corner and the centres of the north and west walls, and two pairs flanking the narrow gates in the south and east walls. In the courtyard, slightly offset to the northeast, there was a cylindrical keep (the Donjon or Grosse Tour), which was thirty metres high and fifteen metres in diameter with walls 4 metres thick. The keep was encircled by a deep, dry moat with stone counterscarps to help prevent the scaling of its walls with ladders. Accommodations in the fortress were supplied by the vaulted chambers of the keep as well as two wings built against the insides of the curtain walls of the west and south sides. The castle was a fortress, but not yet a royal residence; the monarch's Parisian home at the time was the Palais de la Cité. The circular plans of the towers and the keep avoided the dead angles created by square or rectangular designs which allowed attackers to approach out of firing range. Cylindrical keeps were typical of French castles at the time, but few were the size of the Louvre's. It became a symbol of the power of the monarchy and was mentioned in the oath of allegiance to the king, even up to the end of the ancien régime, long after the Grosse Tour was demolished in 1528. The Louvre was renovated frequently through the Middle Ages. Under Louis IX in the mid-13th century, the Louvre became the home of the royal treasury. Under the Valois dynasty, it housed a prison and courtrooms. The growth of the city and the advent of the Hundred Years' War led Etienne Marcel, provost of the merchants of Paris, to construct an earthen rampart outside the wall of Philip (1356–1358). The new wall was continued and enhanced under Charles V. Remnants of the wall of Charles V can be viewed in the present-day Louvre's Galerie du Carrousel. From its westernmost point at the Tour du Bois, the new wall extended east along the north bank of the Seine to the old wall, enclosing the Louvre and greatly reducing its military value. After a humiliation suffered by Charles at the Palais de la Cité, he resolved to abandon it and make the Louvre into a royal residence. The transformation from a fortress to a palace took place from 1360 to 1380. The curtain wall was pierced with windows, new wings were added to the courtyard, and elaborate chimneys, turrets, and pinnacles to the top. Known as the joli Louvre ("pretty Louvre"), Charles V's pleasure palace can be seen in the illustration The Month of October from the Duc du Berry's Très Riches Heures. In 1528, after returning from his captivity in Spain, Francis I ordered the demolition of the keep. At the Palace of Fontainebleau, Francis acquired what would become the nucleus of the Louvre's holdings; his acquisitions included Leonardo da Vinci's Mona Lisa. In 1546 he commissioned the architect Pierre Lescot and sculptor Jean Goujon to modernize the Louvre into a Renaissance style palace. Lescot had previously worked on the châteaux of the Loire Valley and was adopted as the project architect. The death of Francis I in 1547, interrupted the work, but it was continued under Henry II, beginning in 1549. Lescot demolished the west wing of the old Louvre and rebuilt it (now known as the Lescot Wing), added a ceiling to Henry II's bedroom in the Pavillon du Roi that departed from the traditional beamed style, and installed the Salle des Caryatides, which featured sculpted caryatids based on Greek and Roman works. Art historian Anthony Blunt refers to Lescot's work "as a form of French classicism, having its own principles and its own harmony". During the reigns of François II and Charles IX (c. 1559–1567), Lescot demolished the south wing of the old Louvre and replaced it with a duplication of the Lescot Wing. The intention was presumably to create a four-sided château the same size as the old Louvre and similar to the Château d'Écouen, with an identical third wing to the north and a lower, entrance wing on the east. Lescot also designed the Petite Galerie, which ran from the southwest corner of the Louvre to the Seine. However, all work stopped in the late 1560s because of the Wars of Religion. In the meantime, beginning in 1564, Catherine de' Medici directed the building of a château to the west, outside the wall of Charles V. It became known as the Palais des Tuileries because it was built on the site of an old tile factory (tuileries). Her architect Philibert de l'Orme began the project, and was replaced after his death in 1570 by Jean Bullant. The Bourbons took control of France in 1589. During his reign (1589–1610), Henry IV began his "Grand Design" to remove remnants of the medieval fortress, to increase the Cour Carrée's area, and to create a link between the Palais des Tuileries and the Louvre. The link was completed via the Grande Galerie by architects Jacques II Androuet du Cerceau and Louis Métezeau. South facade of the Renaissance Louvre, painted by Zeeman c. 1650. The east end of the Grande Galerie is on the left and the Petit-Bourbon, on the right. In the early 17th century, Louis XIII began the doubling of the length of the Lescot Wing to the north. His architect, Jacques Lemercier, designed and completed the wing by c. 1642. His central pavilion subsequently became known as the Pavillon de l'Horloge, after a clock was added in 1857. Lemercier also began construction of the first part of the north wing heading east. In 1659, Louis XIV instigated a phase of construction under architect Louis Le Vau and painter Charles Le Brun. Le Vau oversaw the remodelling and completion of the Tuileries Palace, and at the Louvre, the completion of the carcass of the north wing, the doubling of the length of the south wing, the decoration of the Pavillon du Roi, the creation of the Grand Cabinet du Roi (a new gallery parallel to the Petite Galerie), and a chapel. Le Brun decorated the Galerie d'Apollon. The landscape architect André Le Nôtre redesigned the Tuileries garden in the French style, which had been created in 1564 by Catherine de' Medici in the Italian style. The Cabinet du Roi consisted of seven rooms west of the Galerie d'Apollon on the upper floor of the remodeled Petite Galerie. Many of the king's paintings were placed in these rooms in 1673, when it became an art gallery, accessible to certain art lovers as a kind of museum. In 1681, after the court moved to Versailles, 26 of the paintings were transferred there, somewhat diminishing the collection, but it is mentioned in Paris guide books from 1684 on, and was shown to ambassadors from Siam in 1686. Commissioned by Louis XIV, a committee of architects, the Petit Conseil, comprising Le Vau, Le Brun and Claude Perrault, designed the east facade of the Louvre; it was begun in 1668 and completed c. 1680, during the reign of Louis XIV, but the wing behind it was not finished until the 19th century with the advent of Napoleon. The definitive design is attributed to Perrault, who made the final alterations needed to accommodate a decision to double the width of the south wing. The east facade is crowned by an uncompromising Italian balustrade along its distinctly non-French flat roof, it was a ground-breaking departure in French architecture. The severe design was chosen over a design provided by the great Italian architect Bernini, who had journeyed to Paris specifically to work on the Louvre. Perrault had translated the Roman architect Vitruvius into French. Now Perrault's rhythmical paired columns form a shadowed colonnade with a central pedimented triumphal arch entrance raised on a high, rather defensive base, in a restrained classicizing baroque manner that has provided models for grand edifices in Europe and America for centuries. The Metropolitan Museum in New York, for one example, reflects Perrault's Louvre design. The Louvre on the Turgot map of Paris, published in 1739. Louis XIV never finished putting a roof on the north and east wings or the south half to the south wing; it was finally added a century later, under Napoleon. Perrault was also responsible for the doubling of the width of the south wing, covering Le Vau's original south facade, and designing a new south facade more compatible with the east facade. He also designed the north wing's city-side facade, and is thought to have been responsible for the design of the north, east, and south facades of the Cour Carrée. The Tuileries Palace was set afire by the Communards during the suppression of the Paris Commune in May 1871. The Gambetta monument in the Cour Napoléon c. 1900. In 1806, the construction of the Arc de Triomphe du Carrousel began, situated between the two western wings, commissioned by Emperor Napoleon I to commemorate his military victories, designed by architect Charles Percier, surmounted by a quadriga sculpted by François Joseph Bosio, and completed in 1808. In May 1871, during the suppression of the Paris Commune, the Tuileries Palace was set on fire by the Communards. The palace was entirely destroyed, with the exception of Pavilion de Flore. The Richelieu Library of the Louvre was destroyed in the fire, but the rest of the museum was saved by the efforts of firemen and museum curators. The western end of the Louvre courtyard has remained open since, forming the Cour d'honneur. Portions of the Pavillon de Flore and the Pavillon de Marsan, at the westernmost extremity of the Palace (south and north limbs, respectively), were damaged when the Tuileries Palace was destroyed by fire in 1871, but were subsequently restored beginning in 1874. Continued expansion and embellishment of the Louvre continued through 1876. After much debate the Third Republic decided to demolish the ruins of the Tuileries Palace, carried out in 1882. The Flore Pavilion then served as the model for the renovation of the Marsan for the Musée des Arts Decoratifs by architect Gaston Redon in 1905. 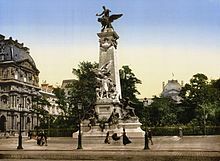 In 1888 a monument to Léon Gambetta was erected in the centre of the Cour Napoléon, where the Pyramid stands today, which was then filled by two gardens, one of which contained a statue of Lafayette. These squares and statues were removed in 1954 to clear the view of the Pavillon de l’Horloge. In 1983, French President François Mitterrand proposed the Grand Louvre plan to renovate the building and move the Finance Ministry out of the Richelieu wing, allowing displays throughout the building. American architect I. M. Pei was awarded the project and proposed a modernist glass pyramid for the central courtyard. The Pyramid and its underground lobby were opened to the public on 29 March 1989. Controversial from before its opening, it has become an accepted Parisian architectural landmark. The second phase of the Grand Louvre plan, La Pyramide Inversée (The Inverted Pyramid), was completed in 1993. As part of the Grand Louvre project, the Louvre Palace was divided into three geographical zones (or wings), named for the pavilions through which they are entered from the reception area under the Pyramid in the Cour Napoléon: the Sully wing to the east (the 'old' Louvre, surrounding the Cour Carrée); the Richelieu wing to the north (on the rue de Rivoli); and the Denon wing to the south (bordering the Seine). Since 2003, the Comité national pour la reconstruction des Tuileries has been proposing to rebuild the Tuileries Palace. Since the destruction of 1883, the famous perspective of the Champs-Élysées, which ended on the façade of the Tuileries Palace, now ends at the Arc de Triomphe du Carrousel, formerly centered on the Tuileries but now occupying a large empty space. The Louvre, with its pyramid on the one hand, and the Axe historique of the Place de la Concorde-Champs-Élysées-Arc de Triomphe on the other, are not aligned on the same axis. The Palace of the Tuileries, which was located at the junction of these two diverging axes, helped to disguise this bending of the axes. Also, it is emphasized that the Musée du Louvre needs to expand its ground plan to properly display all its collections, and if the Tuileries Palace were rebuilt the Louvre could expand into the rebuilt palace. It's also proposed to rebuild the state apartments of the Second Empire as they stood in 1871, as all the furniture and paintings from the palace survived the 1871 fire because they had been removed in 1870 at the start of the Franco-Prussian War and stored in secure locations. Today, the furniture and paintings are still deposited in storehouses and are not on public display due to the lack of space in the Louvre. It is argued that recreating the state apartments of the Tuileries would allow the display of these treasures of the Second Empire style which are currently hidden. The oldest part of the above-ground Louvre is the southwest corner of the square block that faces the center of Paris to the east. This corner section, consisting of the Lescot Wing (1) and the north side of the western part of the south wing (2), was designed and constructed in the 16th century by Pierre Lescot, who replaced the corresponding wings of the medieval Louvre (not shown). Later that century, the Petite Galerie (4) was added, connecting the Louvre to the section of the wall of Charles V which ran along the north bank of the Seine toward the Tuileries Palace (3, 5, 8, 11, 14; destroyed by fire in 1871). Around 1600, during the reign of Henri IV, the wall along the river was replaced with the Grande Galerie (6, 7), which provided a covered passage from the Louvre to Tuileries Palace and later was the first part of the Louvre to become a museum. The Lescot Wing was expanded north with the Lemercier Wing (9) under Louis XIII, and in the second half of the 17th century, during the reign of Louis XIV, the Petite Galerie was enlarged (10, 13) and the remaining wings around the Square Court (12, 16) were constructed, but not totally completed until the first part of the 19th century under Napoleon, who also added the Arc du Carrousel (17) and parts of the north wing (17) along the rue de Rivoli. Later in the 19th century, the north wing was slightly extended (18) by Louis XVIII. From 1852 to 1857, Napoleon III connected the north wing to the buildings surrounding the Square Court with the Richelieu Wing (19, north part) and enlarged the Grande Galerie with the Denon Wing (19, south part). In 1861–1870 his architect Hector Lefuel carried out further work, replacing the Pavillon de Flore and the western section of the Grande Galerie (7) and adding the Pavillon des Sessions (20, also known as the Pavillon des États). In 1874–1880 he replaced the Pavillon de Marsan (15) and extended the south facade of the adjacent Marsan Wing (21). ^ Bezombes 1994, p. 61. ^ Hanser 2006, p. 115; see also Wolfcatcher Royal; and Louveterie on the French Wikipédia. ^ "The Louvre: One for the Ages". 2008. Retrieved 29 September 2008. ^ a b "The History of the Louvre: From Château to Museum". 2008. Retrieved 29 September 2008. ^ Chaundy, Bob (29 September 2006). "Faces of the Week". BBC. Retrieved 5 October 2007. ^ Ayers 2004, p. 34. Sources differ on when the decision was taken to expand the courtyard to its current size by doubling the lengths of the wings. Ayers states that this idea was first proposed in October 1594 (Ayers 2004, p. 35); Bautier, that the decision was made by Henri IV (Bautier 1995, p. 39). On the other hand, Ballon writes that Henri II approved Lescot's plan to quadruple its size in 1551 (Ballon 1991, p. 16), and Mignot, that the change was proposed by Lescot under Henri II (Mignot 1999, p. 38). ^ Drawing by architect Henri Legrand (1868) based on historical documents reproduced in Adolphe Berty 1868, after p. 168 (at Gallica). ^ Markham, James M. (30 March 1989). "Mobs, Delight and a President for Guide As the Louvre Pyramid Opens to the Public". The New York Times. Retrieved 1 February 2017. ^ "Louvre Pyramid" at AViewOnCities website. ^ "Online Extra: Q&A with the Louvre's Henri Loyrette". Business Week Online. 17 June 2002. Archived from the original on 10 December 2013. Retrieved 26 April 2015. ^ "Alain Boumier, président du Comité national pour la reconstruction des Tuileries, en chat sur L'Internaute" (in French). Linternaute.com. 2006-12-09. Bezombes, Dominique, editor (1994). The Grand Louvre: History of a Project. Paris: Moniteur. ISBN 9782281190793. Blunt, Anthony; Beresford, Richard (1999). Art and architecture in France, 1500–1700. New Haven: Yale University Press. ISBN 0-300-07748-3. Sturdy, David (1995). Science and social status: the members of the Académie des sciences 1666–1750. Woodbridge, Suffolk, U.K.: Boydell Press. ISBN 085115395X. Preview at Google Books. Wikimedia Commons has media related to Palais du Louvre. Wikimedia Commons has media related to Sculpted decoration of the Louvre.